Beirut – Organized by the Arab Academy of Sciences (AAS), in collaboration with University of Petra, and UNESCO, the 16th edition of the “Higher Education in the Arab World… Building a Culture of Innovation and Entrepreneurship” conference kicked off in Beirut. The conference was chaired by Dr Adnan Badran, the President of the AAS and former Premier of Jordan, with the participation of Dr Talal Abu-Ghazaleh, the Founder and Chairman of Talal Abu-Ghazaleh Group, Dr Sultan Abu Orabi, the Secretary General of the Association of Arab Universities, and Ambassador Salwa Ghaddar. Badran shed light on the reality of education in the Arab universities which needs to be restructured. He presented a comparison between the world’s high-profile universities such as Harvard, and the Arab universities which count 1000 universities that, unfortunately, achieved nothing so far. 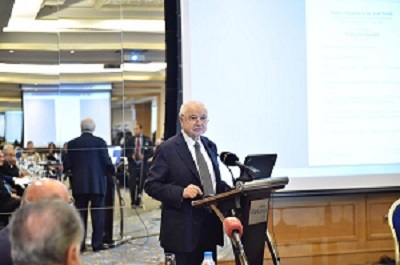 For his part, HE Dr. Talal Abu-Ghazaleh pointed out that EDUCA means “from teaching to learning, and innovating,” calling for putting an end for teaching to be guides to students for learning. He added “let us teach to produce innovators, pointing at AI TAGUICI students who graduate with an invention not by examination. Abu-Ghazaleh stressed the need for high school and university graduates to be inventors with startups that would offer jobs for other instead of them looking for jobs. He added that “the educational systems (rules, policies, practices) need to become knowledge systems as in the Knowledge Age we need knowledge schools and knowledge universities,” pointing at his newly-printed book ‘Brave Knowledge World’ in which he presents the power of knowledge and the ICT-based education. He highlighted the need for incubators not university campuses, the need for education by Artificial Intelligence, and the need to promote a culture of venture capital and to implement commercialization of inventions disciplines. “I don’t call for education for all, but rather I call for education to innovate,” Dr Abu-Ghazaleh declared, calling on the participants to try to compare the progress made in the telephone and car technologies over the past 150 years, to the progress made over the same period in the classroom. “Shouldn’t we all feel ashamed?” he added. Abu-Ghazaleh said he wish to explore the possibility of suing the educational system in each country and in the world at large for its failure in meeting the needs of the students and for its incompetence in adapting to the demands of progress, change, and the future. The 2-day conference was attended by a number of deans, academics, and education experts from Jordan, Lebanon, Qatar, Kuwait, Syria, USA, and Britain.